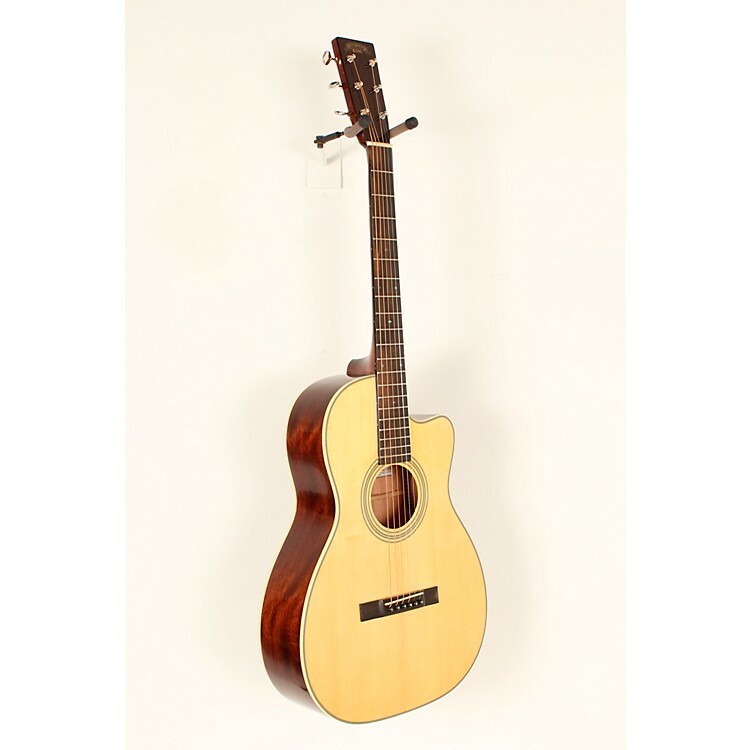 The Recording King Studio Series 12 Fret OO Acoustic/Electric Guitar with Cutaway was developed in collaboration with guitarist and historian Eric Schoenberg. This guitar (model RP2-626-CFE1) offers players the even frequency response, clarity and wider neck traditional to a classic parlor style, but the unique addition of a cutaway gives fingerstyle guitarists easier access to the upper frets. The one-piece mahogany neck with a classic v-profile meets the body at the 12-fret with a hand cut dovetail joint, giving these guitars a true small body sound, warm and rich, but perfectly balanced. The solid AAA Engelmann spruce top and solid mahogany back and sides have been carefully selected and hand-assembled. With a 1-3/4" nut width, Grover tuners, ebony fretboard and ebony pyramid bridge, the OO guitars are as well-appointed and unique as they are beautiful. Each guitar is sprayed with a thin coat of nitrocellulose lacquer and then hand-buffed for a finish that is extremely resonant and historically accurate. The RP2-626-CFE1 model has Recording King's lifetime warranty. This Recording King instrument features a Fishman Matrix VT preamp and pickup system, chosen for the way it compliments perfectly the guitar's natural sound. The system has an endpin mounted preamp with soundhole mounted rotary controls for volume and tone. The size of guitars in this Studio Series are designated by the number of "O"s in their name. Starting with a single "O" for the smallest size and increasing to "OOO" for the largest. Eric Schoenberg's influence on guitar marries traditional fingerstyle playing to classic ragtime and walking basslines. His Fingerpicking Beatles book is considered an essential text for modern fingerstyle players (see our sku# 904086). Mr. Schoenberg prefers the 12-fret cutaway because he believes the 12-fret neck joint gives the guitars a gutsier voice, yet the cutaway is not so deep that it takes away from the sound. As Schoenberg describes it, the Recording King O and OO guitars offer the best of both a 12-fret and a 14-fret neck joint, thanks to the cutaway. Recording King Studio guitars illustrate the relentless pursuit of classic tone. No element has been overlooked in assembling one of the best sounding 12-Fret guitars available. Each guitar is built with lighter bracing for more resonance, and the ebony pyramid bridge helps enable greater vibration from the hand-selected tops. The Nitrocellulose lacquer finish is dried for 8 weeks in order to insure that the lacquer is properly bonded to the wood. Both the gloss and matte finishes allow the guitars to sing powerfully and clearly. Recording King has built the ultimate in small-body guitars for the discerning player who is looking for supreme sound quality and excellence in construction. Case sold separately. Feel and hear the magic of this traditional guitar. Order today.